We offer the most comprehensive selection of chromatin research products to cover every step of your experiment workflow, from upstream to downstream. Ultrasonic energy processing of chromatin samples is widely accepted as a better alternative than enzymatic digestion methods. By emphasizing high throughput processing and preventing sample contamination in our sonication technologies, our sonicators can be easily integrated into existing lab workflows and is also particularly suitable for compatibility with next generation applications. Chromatin Immunoprecipitation (ChIP) is an antibody-based method used for determining the location of DNA binding sites on the genome for a particular protein of interest. This technique is a convenient means for studying protein-DNA interactions that occur inside the nucleus of cells and for understanding cellular processes. 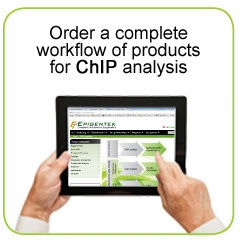 Downstream applications of ChIP include ChIP-PCR, ChIP-sequencing, and ChIP-on-chip (microarrays). The accessibility of regulatory elements in chromatin is critical for many aspects of gene regulation. Nucleosomes positioned over regulatory elements inhibit access of transcription factors to DNA. To elucidate the role of the interactions between chromatin and transcription factors, it is crucial to determine chromatin accessibility through mapping of the nucleosome positioning along the genome. In general, the more condensed the chromatin, the more difficult it is for transcription factors and other DNA binding proteins to access DNA and carry out their tasks. The more accessible the DNA, the more likely surrounding genes are actively transcribed. The presence (or the absence) of nucleosomes directly or indirectly affects a variety of other cellular and metabolic processes such as recombination, replication, centromere formation, and DNA repair. NGS (Next Generation Sequencing) technologies have increased data output volumes and lowered the cost of ChIP sequencing. Epigentek offers many inexpensive solutions for both PCR & NGS, including full package kits to conveniently construct high quality DNA libraries from low quantity or difficult samples.